This relatively new park is an oasis in an urban setting. The entrance of the park is gorgeous! 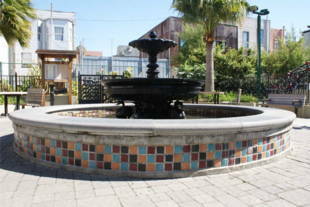 The gate has an arch with a beautiful floral design that greets you; meanwhile, the lovely fountain in front of the entrance may catch your eye. There are tables and benches all around where you can enjoy your lunch. 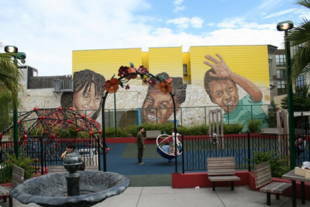 Overlooking the park is a giant 3-story mosaic mural by Josef Norris, which depicts 3 children, created from broken mirror, glass and ceramic tile and paint. The playground is divided, one side designed for younger children while the other side is more for older kids. Ground is made out of soft rubber and the play structures are very colorful. The facilities are all brand new and top notch! There is also a community garden at the back of the park. More information, including garden plot availability, is located on the Recreation and Parks Department Urban Agriculture website. 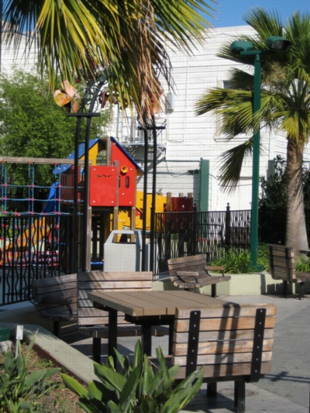 KidPower/Hoff Street Park is owned by the San Francisco Recreation and Park Department. 14-Mission or 22-Fillmore -- 16th and Mission Sreets. 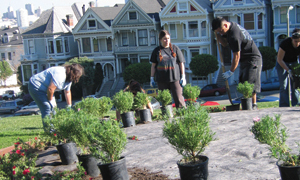 As the name attests, KidPower Park, previously known as the Hoff Street Park, is a testament to the perseverance and vision of the youth in San Francisco's Mission District to transform a dilapidated parking lot into a recreational oasis for the community. After identifying the need for additional recreational facilities in their community, local youth, through a series of appearances before the city's Recreation and Park Commission, successfully advocated for the acquisition of new parkland. The site purchased by the city was hardly ideal: a poorly maintained parking lot located mid-block on a narrow alley, surrounded by commercial and residential buildings. Through a collaborative effort between the community and the city's design and construction management staff, the parking lot was transformed into and inviting, colorful park providing a wide range of recreational activities requested by the local residents. 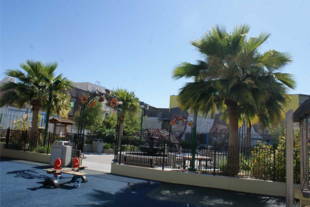 Flanking and entry courtyard featuring a cast-iron fountain and palm trees, the park contains two separate playgrounds for pre-school and school age children. Directly behind the courtyard is a small community garden with raised wood planters. Design elements reflect the Mission District's predominantly Central and South American cultural influences. The primary colors are vibrant reds and greens, and plants of tropical origin create a lush landscape setting. The metal fencing and arbors defining the park's perimeter and interior spaces were enhanced with metal artwork depicting corn, tropical flowers and other traditional symbolic imagery.